TLDR; Alpha 1 of UKRS3 is now available on my Patreon page. I'm sure many people will be wondering why I've gone down the Patreon route. There are a couple of reasons: firstly, of course, even a modest income would help justify the time and effort I’d like to put into creating this content, allowing me to create more, and create faster. But secondly, it's an opportunity to bring more of the community into the development process: like most developers, most of what I've made for OpenTTD has never been released, because it never reached a stage that was suitable for mass consumption. Having a more controlled environment like Patreon will allow work to be shared much earlier in the development cycle, with more feedback, and more motivation. Hello with returning, it's good . I can help You with graphics at summer. I don't think he wants help... Anyway the sprites (from the previews) look as great as ever! 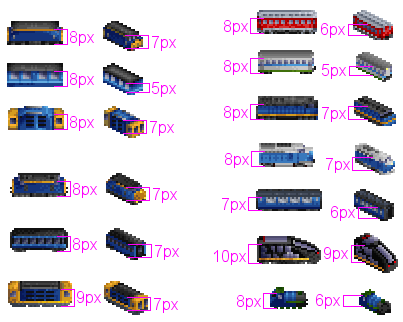 The trains are 32bpp - that is, they're not limited to the TTD 256 colour palette - but they are hand-drawn pixel sprites, made in the same way as a traditional 8bpp set. Tony Pixel asked me in PM what program I draw in: I use PaintShop Pro 7 - which is very old, but what I'm used to for pixel graphics. If I were starting today I'd use GIMP or paint.net. Another tool I'm using to create graphics is Processing, for procedural generation of ground tiles and wall textures. I've added a couple of posts about Processing sprites, including an alpha of my ground tiles and some example code, to the Patreon page this morning. It looks awesome anyways, i like seeing new graphics, especially in 32bpp. It would then lack road vehicles, but honestly you could do something with HOVS, though it's no more updated. Between UKRS3, RUKTS and BORTS it's going to get interesting. I'm curious, what made you decide to start making stuff for TTD again? Between UKRS3 and the CivilAI updates, it sure looks like you've been busy lately. I remember you decided all of your mods were done and quit quite a while ago. I'm curious, what made you decide to start making stuff for TTD again? Between UKRS3 and the CivilAI updates, it sure looks like you've been busy lately. On the other hand, I'm at a point in my life right now where I need to prioritise paying work - hence the Patreon. I've had a bit of spare time the last few weeks to pick everything back up, but it'll be difficult to sustain if I can't at least make a modest income from it. It's the same problem that lead me to Kickstarter a few years ago, but I'm hoping Patreon - and UKRS3 - will be a better fit for the community. Great to see you working on more UK graphics, I've always loved them. Can't wait to see what you have in the future for this! That little teaser line up is very pleasant. If you wait a couple of months I might be able to make a regular donation. To be honest, when I first saw this thread I was a bit dissappointed, because I thought you were going kind of commercial. I think it is ok to support a developer (or development team) to finally get a free-for-all result (be it GRFs, AI's, patches, or maybe even updates of Trunk, etc) or also the maintaining and moderating of this Forum. There's an old paypal donation button on https://pikkarail.com/trainz/ which still works, if you'd like to go down that route. Someone asked me in PM about cryptocurrencies, too - sorry, that's not really something I do. The advantage of using Patreon is how simple a platform it is for sharing alpha files and other development goodies. It's something I can build on as time goes by, rather than being a one-off donation drive. It's fun comparing the new sprites to UKRS2. I didn't reference the old sprite at all while drawing, but in shape and texture it's come out very similar, despite being higher resolution and 32bpp. The new one looks quite a bit taller. Aren't you going to keep the smaller loading gauge? The smaller loading gauge was always a bit of a strange idea - there were few enough pixels as it was, without drawing vehicles even smaller. The new one also looks taller because it's equal-height in the diagonal view, which older TTD sprites often weren't. The smaller UKRS trains do look nice, though. I think they fit better in the TTD proportions, they don't appear that massive next to houses for example. On the other hand if you mix trainsets it looks very weird, plus road vehicles also look just as large if not larger than train vehicles. I think they fit better in the TTD proportions, they don't appear that massive next to houses for example. All depends how big the houses are, doesn't it? For UKRS3 it would be great if later trains would be added, but still regular rail, not monorail/maglev, as far as maybe 2050. I'm not going to do futuristic vehicles, primarily because players don't connect as much with fictional vehicles. Given the complexities of technology, politics, and social change that informed historical vehicle development, it's hard to make futuristic vehicles which aren't bland and boring. Also, by the turn of the 21st century, locomotive stats have reached the point where further increases in power or traction become meaningless at TTD scale - unless you have a wholesale paradigm shift like maglev. I think the game is most interesting when trains of different speeds, powers and acceleration are mixing on one network, so the 20th century is definitely where I want to keep the focus. I do have a few 21st century vehicles - mainly passenger train sets like the Voyager and Javelin - planned out. But they're really there because I know people familiar with those trains would like to see them, rather than because I think they'll be good for gameplay. Sure. I take it you're planning a town set as well?